Regardless of who we are, the main purpose of our life–you could call it ‘the heart of being human’–is to be happy. All of us share the same wish, the same right, to seek happiness and to avoid suffering. One is based more on physical comfort or pleasure, the happiness of the senses. The other is founded on a deeper, mental contentment. 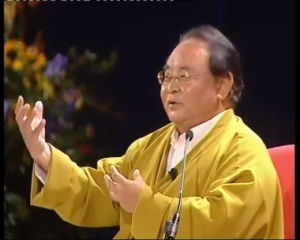 In June 2009, as part of the events held for His Holiness the Dalai Lama’s teachings in Amsterdam, Sogyal Rinpoche gave a memorable talk on Finding Peace and Stability in a Troubled World to an audience of thousands. In the second and final part of this talk, which you can find here, Rinpoche continues by talking about the deeper aspects of meditation as a way of coming to know the mind, of working with our thoughts and emotions, of overcoming fear and anxiety, leading us to the only lasting and durable happiness and peace.